Mary II, Queen o Scots (1662-1694) wis a Queen o Scots. She wis co-moenarched wie William II (Wullie II). She dee'd in 1694 an Wullie wis keeng aw the way till 1702 when Mary's seester teuk aer acomin Anne I o Great Britain in 1707. She wis a sister o Anne, Queen o Great Breetain as well as a cousin o Louis XIV. 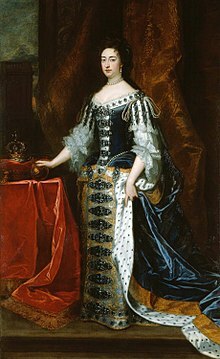 30 April 1662 – 4 November 1677 Her Highness The Lady Mary. 4 November 1677 – 13 Februar 1689 Her Highness The Princess o Orange. 13 Februar 1689 – 28 December 1694 'Her Majesty The Queen. This page wis last eeditit on 23 Februar 2019, at 17:40.